For those who've long thought cowboys spend their nights on the range crooning lullabies to cattle, this book will come as a shock. To those who love joining in a lusty chorus of the kind of song their mothers probably never taught them—and to those who are serous students of folk music, cowboys, or the American West—Guy Logsdon offers an eye-opener of another sort. This is the first field collection of songs from working cowboys to be published in many years. 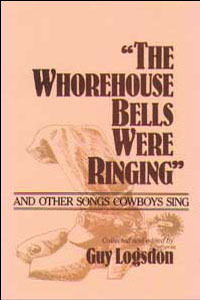 Honest and realistic, it's also the first to demonstrate that bawdy songs have always been an integral part of cowboy culture. "The cowboy sings what he knows from his past and what appeals to his emotions," Logsdon writes. "He is a sentimentalist. But his favorite songs are robust bawdy songs that range (as do 'dirty' jokes and stories) from gross to clever humor." Logsdon has painstakingly sought out, listened to, and recorded the songs of America's working cowboys. While this may tarnish the popular image of the cowboy, it creates a much more thorough and accurate portrait of a specific group of working men. "Bawdy material has always been integral to cowboy culture, although sadly neglected or suppressed by folklorists and historians. Guy Logsdon, with great skill and humor, corrects this long-bowdlerized occupational record. "—Archie Green, author of "Only a Miner: Studies in Recorded Coal-Mining Songs. "Here's an important side of cowboy life we all knew existed but about which little has been written. This is a major contribution to folklore and popular culture history and the social psychology of American cowboy culture. "—Kenneth S. Goldstein, chairman, Department of Folklore and Folklife, University of Pennsylvania. Guy Logsdon is retired as director of libraries and professor of education and American folklife at the University of Tulsa. Currently he his active as a writer and entertainer.